It was reported yesterday that Warner Bros. is developing a new standalone Joker movie, which will bring back Suicide Squad star Jared Leto, but some have wondered how that will impact another Joker project. Back in August, it was revealed that Todd Phillips will be directing a Joker origin movie, which will be written by Scott Silver (8 Mile) and produced by the legendary Martin Scorsese, but even with Warner Bros. moving forward with this Jared Leto project, this other Joker origin story is also still moving forward, with the long-rumored Joaquin Phoenix still attached to star. This is all made possible by the fact that this Joker origin movie will be set in a different universe aside from the DCEU. This new report claimed that the untitled Joker origin movie, "is still in development and will fall under a different DC origins cinematic banner, to separate it from the titles set during the current day." There has been talk for quite some time about Warner Bros. developing a separate DC movie universe aside from the DCEU, and it seems this untitled Joker origin movie will fall within that untitled universe. This report also indicates that Joaquin Phoenix is now officially signed on, although that has yet to be confirmed by Warner Bros. yet, but given the rumors that have already surfaced about Phoenix coming aboard, it's not too surprising. The original report from October stated that this currently unnamed separate DC universe, "can expand the canon of DC properties and create unique storylines with different actors playing the iconic characters." This isn't dissimilar to the comic books themselves, with both DC and Marvel featuring different universes with unique characters playing these same heroes. If DC can pull this off, it will be one thing that will distinguish itself from the Marvel Cinematic Universe, which keeps growing and growing under the same cinematic world, so to speak. There has been no indication as to what other movies may be developed under this secretive new cinematic universe, but the DCEU keeps growing with a number of projects in development, including a few more projects that may include Jared Leto's Joker movie. There has been talk of a movie with just Harley Quinn (Margot Robbie) and The Joker, along with Suicide Squad 2 and this new stand alone movie. There is also a Batgirl movie in development along with Gotham City Sirens, Birds of Prey and The Batman, just to name a few. There is also a Justice League sequel, along with Flashpoint, Green Lantern Corps and Cyborg, although the future of those projects haven't been set in stone. The next DCEU adventure will be Aquaman, in theaters December 21, with Shazam slated to arrive on April 5, 2019 and Wonder Woman 2, which starts filming this summer, already set for a November 1, 2019 release. 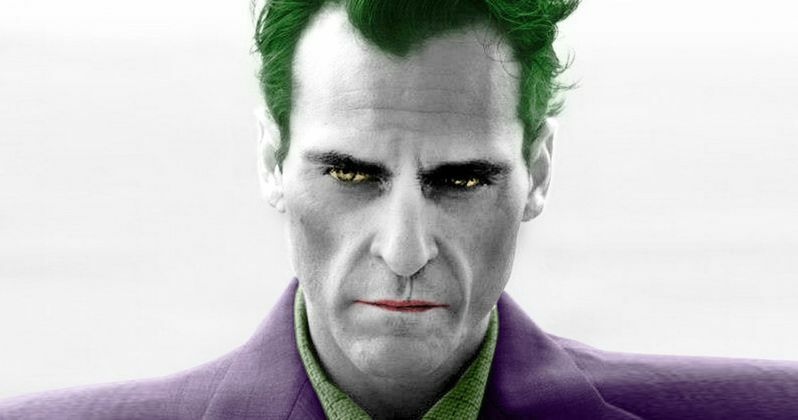 Deadline reported that this Joker movie starring Joaquin Phoenix is still in the works. Still, there is no indication as to when we may get any official updates about the project.